Today I am very excited to share the new pattern I have been working on over the past couple of months. I am extra excited because I have been working together with someone who is one of my sewing superstars! A couple of months ago, Jill from Kneesocks and Goldilocks (IG sewing extraordinaire) and I began communicating about working on a design together. We exchanged sketches, photos, ideas and more ideas and eventually decided on this sweet and vintage inspired dress and top - the Juliette Dress and Top! The name was suggested by Jill for two reasons. 1. I have a daughter named Juliette, and 2. The neck ruffle reminded her of some of the clothes worn by women in the time of Shakespeare...so Juliette it is! If you don't know Jill, you have to follow her on Instagram. She is a part time fertility specialist, part time sewing addict and full time Mum. She lives in Canada with her husband and four children. She mostly sews for her youngest daughter, June...who is the sweetest little four year old you will ever see! Jill has been a big supporter of mine and it has been so much fun working on this project together! Over the next couple of days, you will see some gorgeous photos over on Jill's IG feed. So make sure to check it out! Search #juliettedressandtop too. Now, on to the Juliette dress and top pattern! As the name suggests, the pattern can be made as a dress or a top. 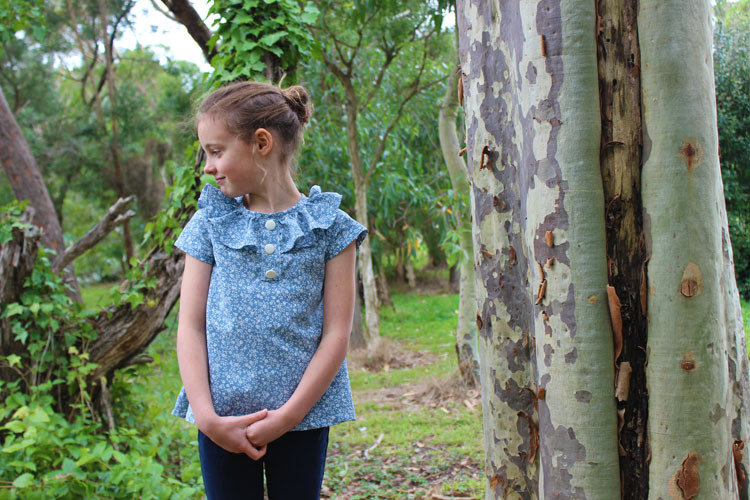 Both feature a gathered neck ruffle, A-line silhouette and bias neckline. 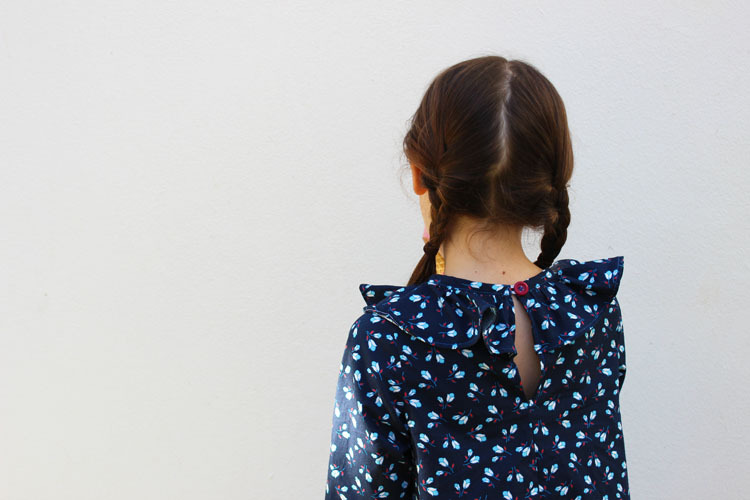 We wanted this pattern to be suitable for beginner sewers, so there are no zips or button holes. The back closes with either a button and loop or bias ties. Juliette can be made sleeveless (with sleeve facings) or with short or three quarter length sleeves. In-seam pockets can be included for those who can't sew a garment without pockets!! An optional button placket can also be added to the centre front for a different detail. This pattern is great for lighter weight woven fabrics such as voile, lawn, liberty and double gauze. It is also perfect sewn up in regular weight quilting cotton. Heavier fabrics are not recommended as the frill will become too stiff. 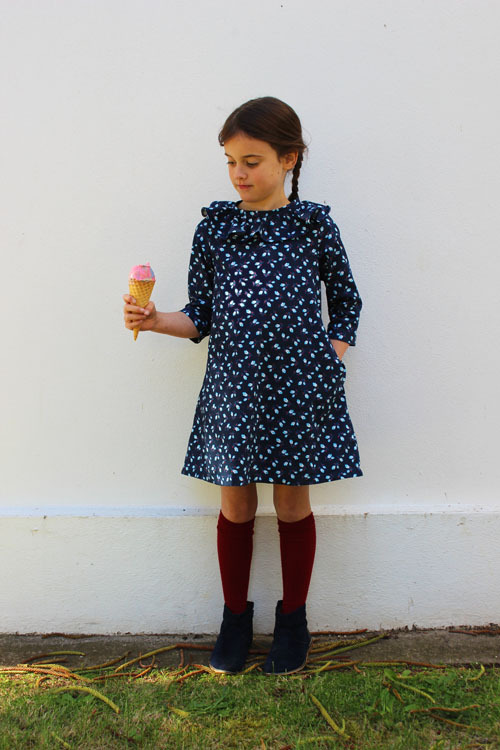 The beautiful fabric for this dress was purchased from one of my favourite online shops - Maai design. It is Soft Cactus - Lightning Lily in dark blue. It is the ideal weight for this design and you will notice on Jill's IG feed, that June is wearing a sleeveless Juliette dress in the mint green colourway of this same fabric design called Lightning Lily in Pastel Turquoise. This was an impromptu photoshoot yesterday after I was not super happy with some photos I took of Juliette in our pine forest. The backdrop was too dark for this dark dress. We were heading in to town later in the day to meet up with my sister in law and sweet little nephew and I decided to take the camera. I noticed the white wall of our local art gallery opposite our meeting spot. 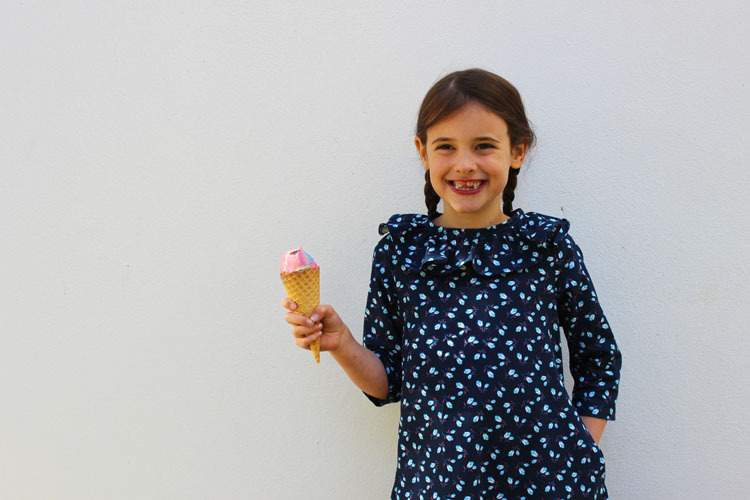 An ice-cream shop opposite provided the perfect reward for Juliette to pose for more photos! 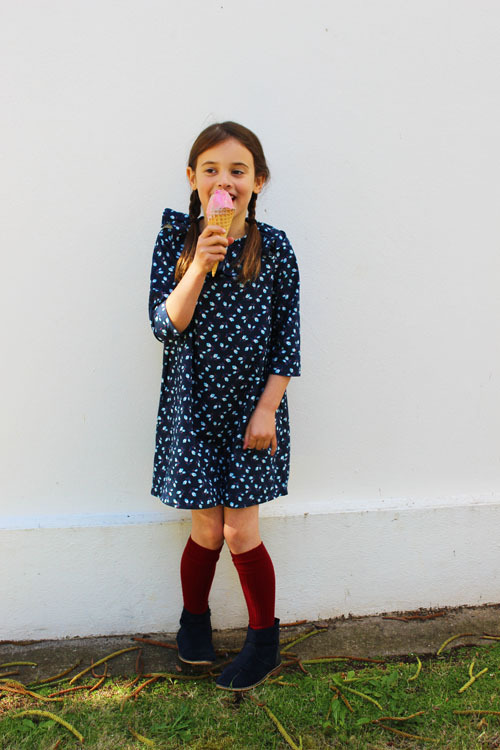 Or rather, eat the ice-cream, smile and let Mummy take photos! Although she does look rather serious in this photo...but it does show the in-seam pocket in action! 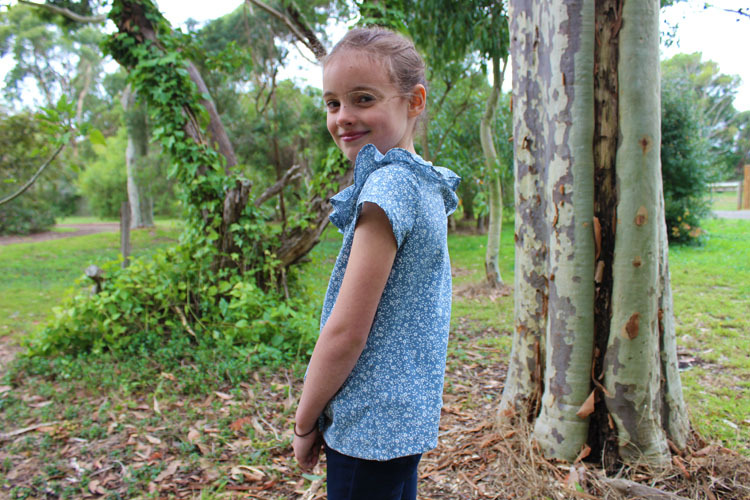 And here are some photos of Isabella in her Juliette top! This was the first prototype I sewed up. I added the button placket and short sleeves. The fabric was a soft cotton tablecloth I found last week at the op shop for $1! Perfect for pattern testing! Not having to install a zip or create a bodice lining is also a nice change. Having said that, those who prefer an invisible zip can easily incorporate one instead of the closures offered in the tutorial. 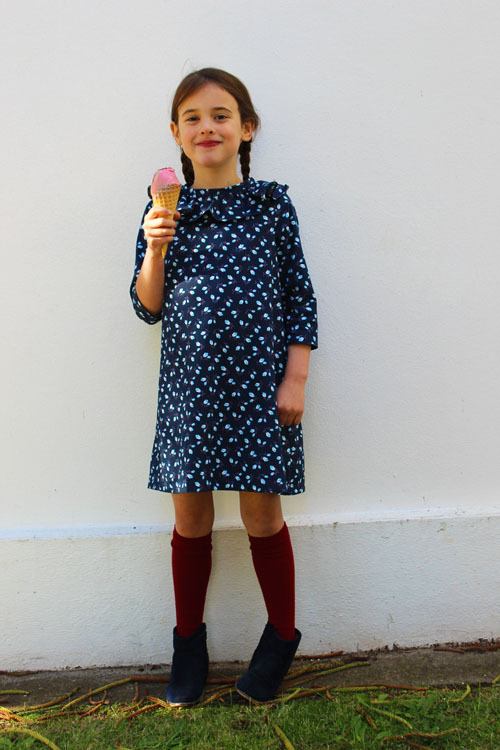 Since I promised exciting sewpony news every Friday for the next few weeks, I hope you will accept a Thursday this week, since I am joining in on a blog tour tomorrow...Stay tuned next week for a call for testers for the Juliette dress and top! thanks Jenya! It is a really fun sew and quick too! Oh God, I love it!!! What a great pattern. I can see my daughter wearing it already. I'll definately sign up foto testen! Thank you Marjolein! You make the loveliest things so can't wait to see what you make with the Juliette pattern! Oh, it's beautiful! 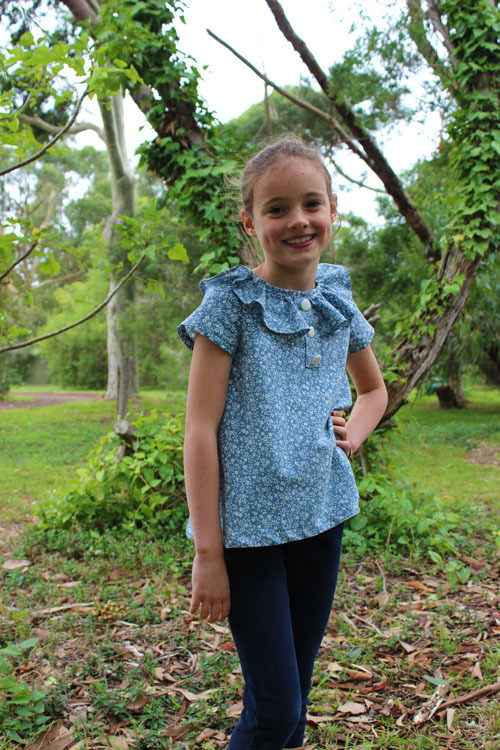 I love both options, and since my girl also loves to wear jeans, the Juliette top is a must-sew! Thank you so much Leentje! Wow, this looks so good! 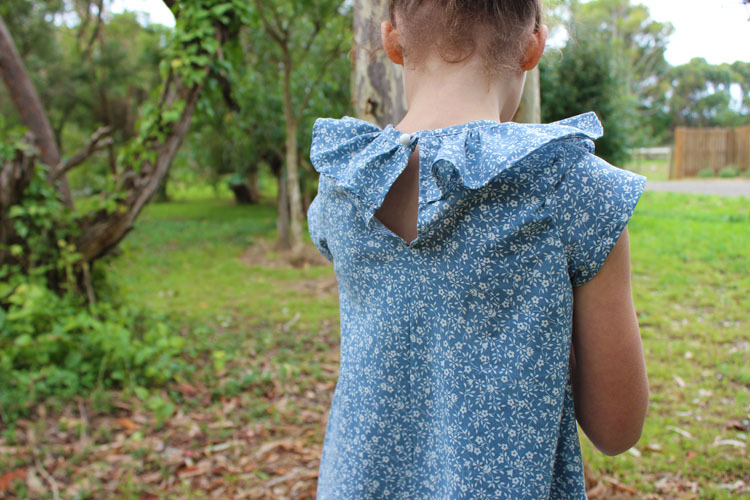 Stunning back and ruffles and my daughter is addicted to pockets. �� I will check out this tester call! Thank you Sofie😄 Call for testers will be next week! What a cute dress and top! What a cute top and dress! Congrats on a collaboration! Thanks everyone! Jill and I are very excited! Love it! My girls will absolutely love this!